For our second post in the Mobile Mondays series, we’ve invited Grace Nasri of FindtheBest to share her company’s experience in going mobile. Read last week’s post to learn about setting mobile goals. Seeing this global trend toward mobile, realizing that large segments of potential consumers only have access to mobile devices, and knowing that about 60% of time spent on smartphones is spent engaging in new activities—meaning potentially new customers— we at FindTheBest decided to launch a mobile-optimized version of our site. 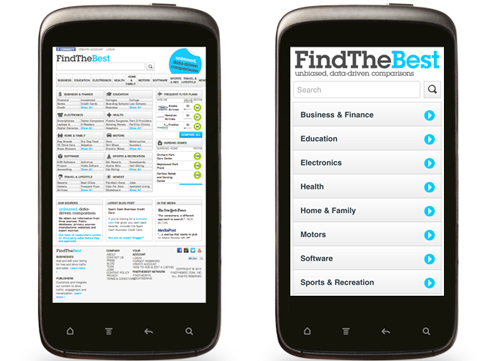 FindTheBest is a data-driven comparison engine, and we launched our mobile site in January after realizing there was a large segment of potential customers we weren’t able to effectively reach. Before launching the mobile site, mobile visitors were 12% more likely to bounce and viewed 27% less pages than desktop visitors. FindTheBest has gone mobile, and has been rewarded with a 3.5x increase in mobile revenue. While traditional desktops offer a lot of real estate, mobile devices are more limited in terms of space. Desktops and laptops have faster Internet connections than mobile devices. Mobile devices are primarily touch-based, which requires an entirely different user interface. We hired a mobile expert to design our mobile site. Several decisions needed to be factored in to guarantee the best user experience, as users who visit mobile sites that don’t offer a great UX often leave a site and go to a competitor site. Since we offer a diverse amount of information presented in a range of ways on the traditional site, we had to limit what it would include in the mobile version. We took into consideration questions like, “What are the most relevant filters that need to be included?” and narrowed the data fields on each comparison’s search results page to only the top three most important ones. Similarly, we made design considerations to ensure users could access the information they needed within three taps and that the pages loaded quickly over 3G networks. After developing and designing the mobile site, we were able to take some of our findings and apply it to the main site. Currently, 25% of our customers are accessing the site through mobile devices. While traffic to FindTheBest is rising by about 15-20% month-over-month, the percentage of mobile users accessing FindTheBest is rising by 25%. Between January 2011 and January 2012, the total number of visits to FindTheBest has grown by 3X, while the number of visits from mobile alone has grown 7X. The week after launching the mobile version, visits from mobile devices increased 28% (as compared to 19% for non-mobile visits). Our user engagement has also significantly increased as page views per mobile visit increased by more than 15%--which reaffirmed the benefit of optimizing for mobile. The mobile site has also translated into more ad revenue for us. After launching the mobile site, our ad revenue from mobile devices increased 3.5X. The benefits of having a mobile-optimized site have also carried over to our publisher partners, which currently include TechCrunch, VentureBeat and Android Authority. We constantly analyze user behavior and continue to optimize the mobile site accordingly. We’re currently researching ways to include responsive design technologies into the site, so that the mobile and desktop code bases can be merged into one. Maintaining multiple code bases is time consuming, but we believe this is the future and will be worth the investment.